The plan provides coverage comparable to the Ontario Health Insurance Plan (OHIP) for Ontario residents and provides insurance to pay the cost of doctor/hospital medical services that students or employees and their dependents might need to maintain their health while in Canada. Your UHIP proof of coverage card will be emailed to you by Sun Life to your Carleton University email account just before the start of the academic term. You can print off your card at home, the library, or anywhere you have printer access. Please be sure to keep this email. If you lose/misplace your card, you can print off another one. 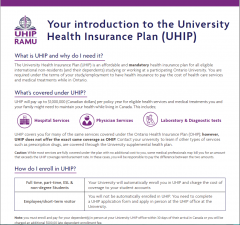 You may also contact your UHIP administrator by ISSO email or phone +1 (613) 520-6600.